Stay in a castle, a cottage or a skyscraper—Québec City has them all. 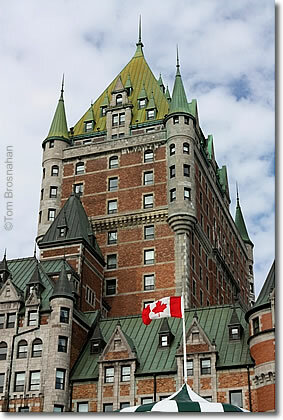 Everyone who knows anything about Québec City knows about Le Chateau Frontenac, the castle-like lodging palace perched at the tip of the rock promontory of Cap Diamant, the most coveted location in all Québec City. The city has many, many other hotels as well, from small, quaint, charming inns within the walls of Vieux Québec (especially facing the Jardin des Gouverneurs behind Le Chateau Frontenac) to modern full-service luxury hotels outside the walls, and inexpensive motels farther into the modern city. Hotel Le Chateau Frontenac, Québec City.